Rooster Jones remains a legend in Pascagoula and all over the state of Mississippi for his exploits at Pascagoula High School from 1974-1976. In 31 games over those three years, Rooster rushed for 3863 yards and scored 51 touchdowns. PHS went 24-7 over that time period including a 12-0 perfect season in 1976 that ended with the crowning of the Panthers as state champions. According to Panther Coach Johnny Woitt, a former professional football player and Panther great himself, Rooster played hurt for two of those years. Of Rooster, he said “As I’ve said before, he’s the best running back I’ve ever seen.” During his injury plagued senior season Rooster rushed for 1895 yards and scored 28 touchdowns and 4 two-point conversions. Rooster signed a scholarship to play college football for Coach Jackie Sherrill at Pittsburgh where the old injuries finally caught up with him and brought his abilities back in to the realm of mortals. He still merited a look in the NFL and according to an old teammate was the last man cut from his squad. Shane Matthews moved to Pascagoula from Cleveland, Mississippi, after his sophomore year in high school when his father, Bill Matthews was named PHS head coach. He was the starting quarterback for the Panthers in 1986 and 1987, leading PHS to an unbeaten and nationally ranked 14-0 season and the Mississippi 5A state championship. For his efforts as a senior, Matthews was named Mississippi Player of the Year. 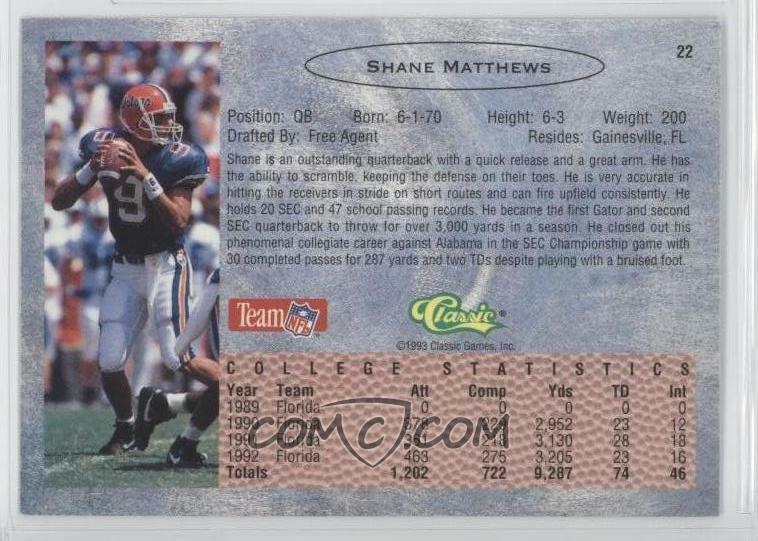 At the University of Florida, Shane was back to back SEC Player of the Year in 1990 and 1991. 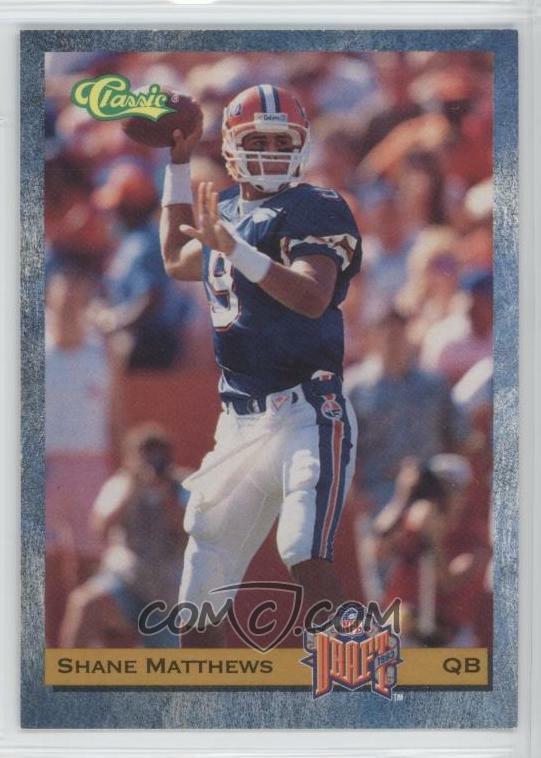 He led the Gators to their first ever SEC championship in 1991, and their first Sugar Bowl appearance. He finished fifth in Heisman Trophy voting his senior season. In 1991 he set 14 school records and 5 SEC records including the league’s season record for TD passes with 28. 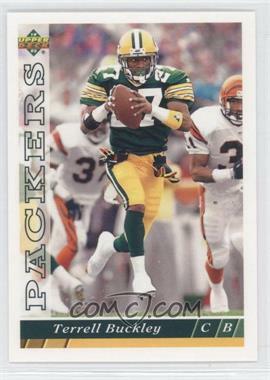 Matthews had a long NFL career playing for the Chicago Bears (1993-1996, 1999-2001), He finished with 4756 passing yards and 31 touchdowns. Terrell Buckley was a starting cornerback for the Pascagoula Panthers in 1987-1988 earning all-state honors both seasons. He played a prominent role on the Panthers’ legendary undefeated 1987 squad. He intercepted 30 passes during his Panther career, returning 7 for touchdowns. He also returned 7 punts for touchdowns. After graduation he signed a scholarship with Florida State after graduating. In baseball, Buckley started two years in center field helping lead his team to a runner-up finish in 5A in 1989. Buckley was a two-year starter and three-year letterman at Florida State (1989-91). He left as the school’s all-time leader in interceptions (21) and interception return yards (501). His career interception yardage total of 501 is a record and he also tied school records for touchdowns off interception returns (four) and punt returns (three). He was named first-team All-America and won the Jim Thorpe Award given annually to nation’s top defensive back as a junior. Buckley led the nation with 12 interceptions for 238 yards and two touchdowns. He was named second-team All-American by the Associated Press, Sporting News and The Football News as a junior when he had six interceptions with two returned for touchdowns. Buckley regularly appeared on the national highlight shows, most famously for his performances in the Michigan and Syracuse games, both on the road, where he scored memorable and dramatic touchdowns. He played two years of varsity baseball and was a sprinter on the outdoor track team for one year. Florida State inducted him into their Hall of Fame in 2003. In 1992, Buckley was the fifth overall pick in the NFL draft by the Green Bay Packers. 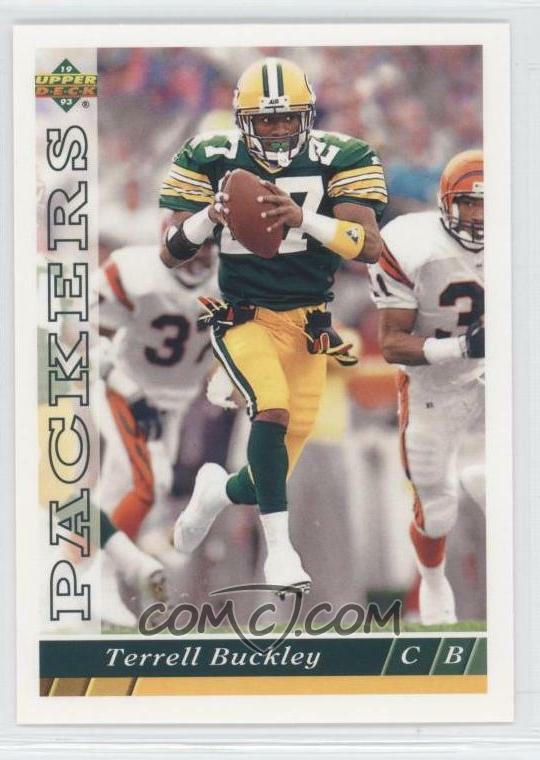 He played in the NFL until 2005 with the Packers (1992-1994), Dolphins (1995-1999, 2003), Broncos (2000), Patriots (2001-2002), Jets (2004) and Giants (2005). He intercepted 50 passes in his career and returned those passes for 793 yards and 6 touchdowns. The 50 interceptions ranks him just outside the all-time top 20 list. He won a Super Bowl ring in 2001 with the Patriots, recovering a fumble in Super Bowl XXXVI that led to a Pats touchdown. Fred Cook was a defensive end who played for the University of Southern Mississippi Golden Eagles before being drafted in the second round of the NFL draft by the Baltimore Colts. 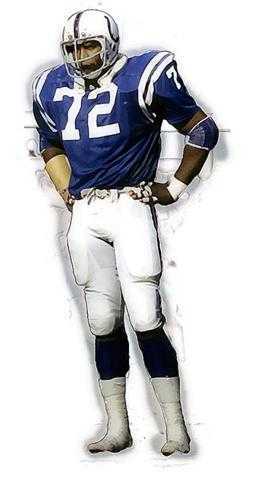 He played for the Colts from 1974-1980. Part of “the Sack Pack” defensive line for the Colts, Cook led his team with nine sacks in 1977, but before they became the Sack Pack, Cook and his linemates liked to call themselves the “Looney Tunes” because they were a loose, fun loving group. A teammate of Cook’s, Joe Ehrmann said of him in 1975, “Freddy Cook is a beautiful guy, mild, easy, with a lot of depth. He’s someone you’d like to fix up with your sister.” Fun loving and young they may have been, but in 1975 the Looney Tunes and Cook led the NFL in sacks. The Looney Tunes, the Sack Pack, whatever you wanted to call them, Cook’s unit helped the Colts to consecutive division titles from 1975-1977. Cook is one of only five Colts with over 100 consecutive career starts (102). He was named 2d team all-conference in 1976 and 1st team in 1977. Fans from that era continue to revere Cook and turned out in numbers to meet him when he returned to Baltimore from his home in Pascagoula for a visit after Hurricane Katrina. Linked below is an interview done for the University of Southern Mississippi Oral History Program. The content is not for re-use without permission, which the HOF doesn’t have, but I encourage you to click and read about Fred’s life as described in his own words. He’s had some hard times not of his making outside of football, but has managed to have a life of public service in spite of it. Sam (Sambo) Leslie was born on July 26, 1905, in Moss Point, Mississippi. He began his professional baseball career playing for the Memphis Chicks in 1927, and in 1929 won the league batting title while still with the Chicks with a .376 average. His Major League Baseball career began October 6, 1929, when the lefty slugger joined legendary manager and Hall of Famer John McGraw’s New York Giants. During his early years with the club he saw action primarily as a pinch hitter and a reserve as he had the misfortune of playing behind longtime Giants first baseman and future Hall of Famer Bill Terry. During the 1932 season, Leslie established a then Major League record by collecting 22 pinch hits. The record held until 1961, and to this day it remains a Giants franchise standard. He also ranks second on the team’s all-time pinch hit list with 57, just one behind the team record. Leslie’s breakout year came in 1933 when he batted .295 with 148 hits and 73 RBI’s in 136 games while playing stints for both the Giants and the Brooklyn Dodgers. In June 1933, Leslie was traded to the Brooklyn Dodgers in exchange for Lefty O’Doul and Watson Clark. His new manager was Casey Stengel, the Old Professor, in his first year as a major league skipper. While with the new club, he became the starting first baseman and continued to excel at the plate batting .332 with 181 hits and 102 RBI’s during the 1934 season. In 1935, he batted .308 with 160 hits and 93 RBI’s. Leslie returned to the New York Giants in February 1936 in exchange for cash and proceeded to split time at first base with player-manager Bill Terry. He was the only player to hit for the cycle in a game in 1936 and was also instrumental in helping the Giants capture the National League pennant in both the 1936 and 1937 seasons. While the team was successful during the regular season, they lost to their cross-town rivals, the American League pennant winning New York Yankees, in the World Series both years 4-2 and 4-1 respectively. During his final tenure with the Giants, Leslie batted .290 with 221 hits and 100 RBI’s from 1936 to 1938. Leslie retired from professional baseball after the 1938 season and retired to Mississippi Gulf Coast and raised his family. He closed out his major league career with a lifetime .304 batting average including 749 hits, 389 RBI’s, and 36 home runs in 822 games. During his 10 years in the major leagues, he rubbed elbows with many legends of the game including hall of fame teammates Mel Ott, Carl Hubbell, and Bill Terry with the Giants, and Hack Wilson and Al Lopez with the Dodgers. For his accomplishments on the field, Leslie was inducted into the Mississippi Sports Hall of Fame in 1968. He passed away in 1979 at the age of 73 after a lengthy illness.